We all know that ours is a very unequal society. The gulf between the rich and the poor in terms of wealth and incomes is enormous. Inequality is also very wide in consumption of luxury goods. But is consumption of food too very unequal? After all, there’s a limit to how much a person can eat. To understand which class of society eats what, we turn to the NSSO survey on Household Consumption of Various Goods and Services in India 2011-12. The report separates per capita consumption into 12 divisions, called fractiles. Fractile 1 is the lowest 5% of the population in terms of consumption, fractile 2 is the next 5%, fractile 3 is the lowest 10-20%, fractile 4 the lowest 20-30% and so on. Fractile 12 is the top 5% of the population in terms of consumption, fractile 11 the 5% below it, fractile 10 the 80-90% group. In other words, the fractile classes used are the percentile classes 0-5%, 5-10%, 10-20%, 20-30%, 30-40%, ..., 70-80%, 80-90%, 90-95%, and 95-100%. These fractiles are taken separately for rural and urban India. The survey shows the per capita monthly consumption of the various fractiles, or classes. 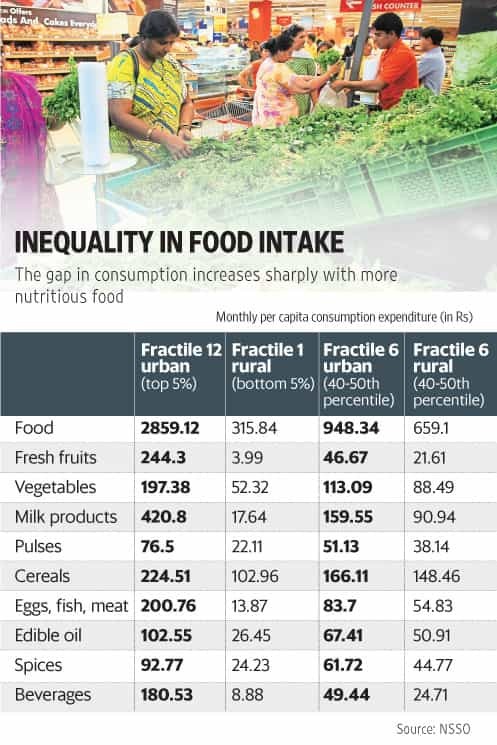 The richest 5% of the urban population spent Rs2,859 per head per month on food in 2011-12, according to the survey, about nine times more than that spent by the bottom 5% of the rural population. The rich don’t spend too much more on cereals—the top 5% in urban India, or fractile 12, spent about 2.2 times the amount spent by the poorest 5% of rural Indians on cereals. But go up the nutrition ladder and a very different picture emerges. The richest 5% spend around three-and-a-half times more on pulses than that spent by the poorest 5%. On vegetables, they spend around 3.8 times more. On eggs, fish and meat, the multiple is 14.5 times, on milk products 23.8 times. And on fresh fruits, which are obviously a luxury, they spend 61 times what the poorest 5% spend. The accompanying chart has the grim details. But the bottom 5% of Indians is destitute. How does the picture change if we compare the 12th fractile of urban India, or the top 5%, with the 6th fractile, or the 40-50th percentile group in urban India, which is around the middle consumption level? Well, here too there’s a big difference in food intake levels. The top 5% of urban Indians spend three times the amount spent on food by those urban Indians falling in 40-50th percentile. They consume 1.5 times more pulses, 2.6 times more milk products, 2.4 times more eggs, fish and meat. As for fresh fruits, the top 5% consumed more than five times as much. The chart shows that the 6th fractile in rural India, or the 40-50th percentile in rural India, consumes much less than its urban counterpart. This doesn’t mean, by any stretch of the imagination, that the top 5% of the urban population are gluttons. Far from it. Let’s take their intake of fresh fruits. Their per capita consumption is 15 bananas a month, or one in two days. They have less than half a kilogram of mangoes a month and 200gm of watermelon. They have one coconut, 700gm of apples and 200gm of grapes in a month. This is very modest consumption. Let’s take beverage consumption. The top 5% in urban India drink 11.3 cups of tea, 1.9 cups of coffee and 20gm of coffee powder and 0.335 litres of fruit juices. This can hardly be called splurging. So how much does the 40-50th urban percentile eat then? They have 5.8 bananas per head per month; three-fourths of an orange a month; 5 cups of tea; 0.012 of a pineapple; almost 5 litres of milk; and 2.8 eggs a month, among other things. Indeed, even the relatively well-off 8th fractile in urban India, or the 60-70th percentile, had 3gm of butter a month, Rs1.45 worth of ice-cream, 3.3 eggs, seven bananas, 1.1 oranges and 2.5 lemons and 7 cups of tea a month. And if this is what those in the middle of India’s consumption ladder eat and drink, there’s not much point in looking at how much the bottom 5% eats. But social divisions in India are not on the basis of class alone but also on caste lines. The NSSO survey of Household Consumer Expenditure across Socio-economic groups 2011-12 has data on consumption by caste. In rural India, the average per capita monthly consumption expenditure on food for Scheduled Tribe households in 2011-12 was Rs630.86; for Scheduled Castes households Rs684.25; for other Backward Classes households Rs757.21 and for “other households" it was Rs879.74. Clearly, caste inequality is reflected in food consumption. Average per capita monthly consumption expenditure on fresh fruits in rural India was Rs19.82 for ST households; Rs25.27 for SC households; Rs33.30 for OBCs and Rs42.06 for “others". Among the “others", those who had more than four hectares of land spent Rs58.28 per month on fresh fruits. In short, what the data throws up are stark facts of poor nutrition among very large sections of the Indian population.